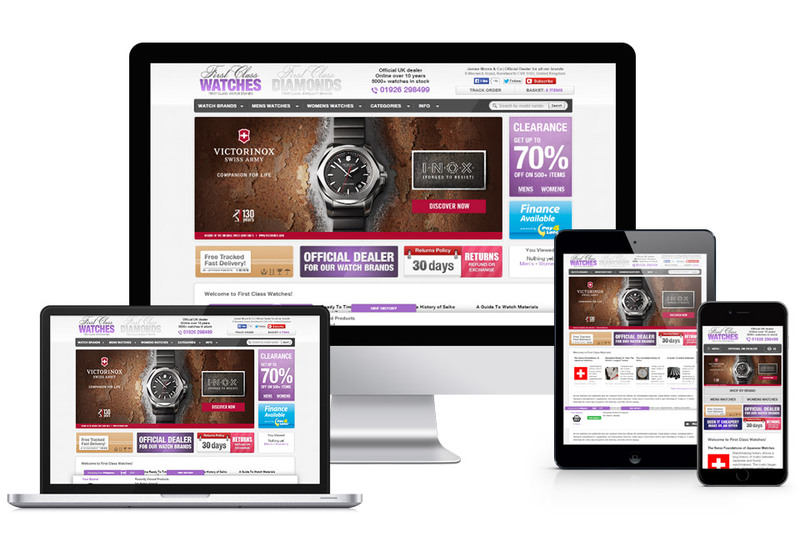 First Class Watches, an official UK retailer for over 60 brands of traditional and designer watches, has launched its new responsive website for mobiles and tablets. This new design will make it even easier for users of smartphones and tablets to browser and shop with First Class Watches. The new responsive website is designed to optimise visually across all the full spectrum of smartphones, tablet devices and desktops without the loss of functionality that is often experienced with more basic mobile websites. The ease of use will provide customers visiting from a mobiles and tablets with the best possible shopping experience. The whole website has been designed with the customer in mind. In order to provide the best shopping experience for these visitors, the new website automatically adapts to the size of the users screen, whether using a desktop, tablet or mobile device. While the changes to the First Class Watches website will be noticeable to anyone familiar with the website, the same style that users will be used to still remain. Meaning customers will enjoy the improved ease of use, without losing any of the familiarity with the website they are used to. Launched in 2005 by high street jewellers James Moore & Co, First Class Watches is a family owned and operated business who have used the power of internet retail to reach customers from all corners of the globe. More than ten years on, they are one of the UK’s largest independent watch retailers with hundreds of thousands of happy customers. Using their responsive website customers can browse a stock of over 5000 watches and more than 60 designer watch brands at their leisure. First Class Watches uses self-photographed 360 degree imagery, product reviews, price matching and free watch adjustment to allow customers to make an informed and quick purchases while receiving the same service and warranty they would expect from a retail store. For more information please contact press@firstclasswatches.co.uk, phone 01926 298499 or visit www.firstclasswatches.co.uk.